Skerries Cycling Initiative are preparing some great events for the 2014 National Bike Week (14-22 June), including a “Cyclist Photo Safari” (Sunday 15 June, 9 a.m., South Strand, little bridge), a “Rediscover your Bike” cycle (20 km) along quiet roads (Saturday evening, 21 June, from 7.30 p.m.), and their much-loved Family Fun Cycle to Ardgillan Park and back (Sunday 22 June). Send them an email at cycling@skerriesca.com for details and to be added to their email Newsletter (first issue coming soon), or like their Facebook page to stay in touch. Skerries Cycling Initiative are a committee of the Skerries Community Association. Cycling photo safari on Sunday 15 June-meet South Strand 9 a.m. Aimed at photographers who cycle and cyclists who photograph, the cycling photo safari will entail a leisurely ride with stops to capture landscapes, beaches and walled gardens in the environs of Skerries. This event will be a nod/celebration in the direction of the Victorian era when the two activities of cycling and photography merged as cycling clubs set up photography sections and photography clubs set up cycling sections to accommodate their crossover members. Meet on South Strand, Holmpatrick end, near the little bridge, at 9 a.m..
After taking some shots here we can cycle to Barnageeragh beach and then take our bikes over Lady’s Stairs and into Ardgillan where the Walled Garden will open at 9.30 a.m. and the Tea Rooms at 10 a.m.. for well-deserved tea/coffee and scones. After that the world, or at least the environs of Skerries, is our oyster! A tour on the day of the Summer Solstice – shall we call it the Giro d’Romance? 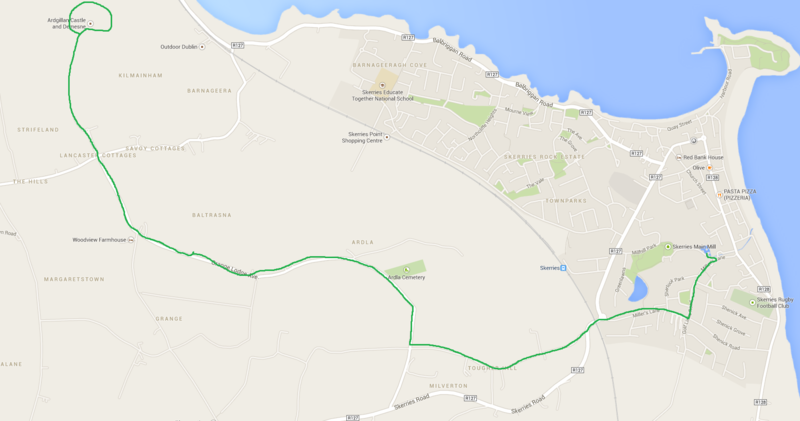 – along some of the quieter roads around Skerries. This is aimed primarily at adults, including those who have bikes but may not have used them for a while. Starting from the Sea Pole at 7.30 p.m on Saturday evening 21 June; we anticipate returning there at around 9.30 p.m.
Map of route below. 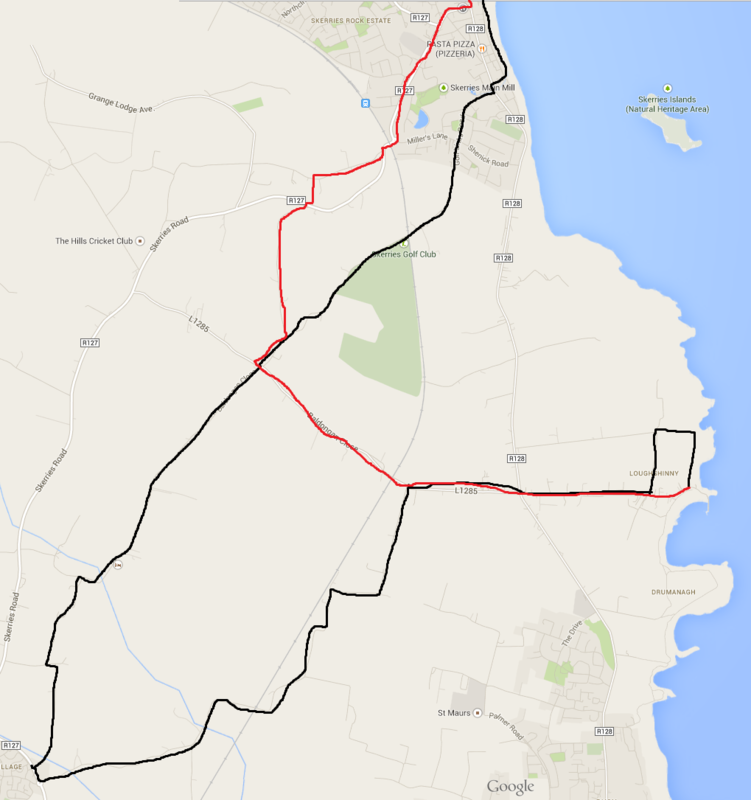 Black line shows route out of Skerries to Loughshinny via Lusk and red line shows return route. Hopefully we can stop and enjoy the view of Loughshinny on a pleasant summer solstice evening. 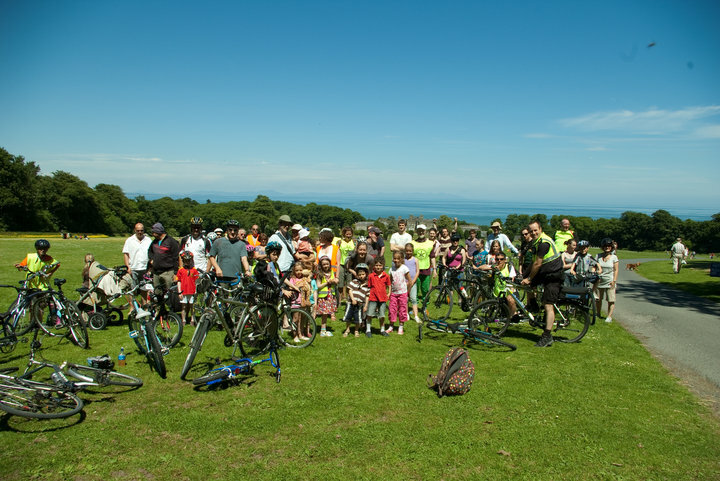 Family Fun Cycle to Ardgillan with a picnic by the Rose Garden. Meet Skerries Mills 12 noon on Sunday 22 June. Bike Week in Skerries would not be complete without the Family Fun Cycle to Ardgillan. All cyclists are welcome on the Fun Cycle, but children must be accompanied by a responsible adult. Please note that there is some hill-climbing involved so gears must be working and children should be instructed in their use. (Please check that the bike is in roadworthy condition including brakes, gears, tyre pressure and saddle height). Children must be capable of using brakes on their bikes as the route includes significant descents in both directions. The SCI will provide stewards to assist the riders in getting through junctions along the way. Route to be followed (see Map): from the Skerries Mills car park via Millers Lane to the railway roundabout (1st catch-up pause), under the bridge followed by an immediate right turn up Togher Hill to Milverton Gates (2nd pause) and right again along Ardla Rd. to Ardgillan (3rd pause at the gates). We will have our BYO picnic by the Rose Garden. For those who want it, a stewarded return to Skerries Mills Car Park will be offered in the early afternoon.